John McCain: Ryan is an "excellent choice," who won't outshine the top of the ticket. "I had that problem," McCain joked. Nevertheless, "I'm still proud of my runningmate. I'm proud of Sarah and her family and the work we did." David Axelrod on President Obama's opinion of Ryan: "He thinks he's a perfectly genial and bright guy. He just thinks his theory is wrong. 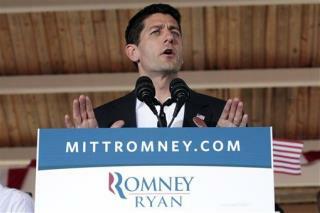 I mean Congressman Ryan is a right-wing ideologue and that's reflected in the positions that he's taken." Tim Pawlenty: "I'm not disappointed. I didn't get something I didn't expect." Debbie Wasserman Schultz: By picking Ryan, Romney has endorsed "shredding the safety net" of Medicare and "embraced an extremist proposal." The ticket would stick seniors with "massive gaps in coverage and drive their health care costs up." Newt Gingrich on Ryan's 'right-wing social engineering': "He came back with an improved Medicare plan. He met my only objection. You now have a national leader who is capable of talking in detail with the American people about some very complicated topics." Scott Walker on Wisconsin: "I thought it was competitive after our election, and I think it's even more competitive with Paul Ryan on the line." Wisconsinites want candidates "who are courageous and willing to take on tough decisions and Mitt Romney and Paul Ryan are exactly the kind of comeback team to make that happen." "Obama thinks he is smart and in command of the facts. Ryan ACTUALLY is." According to the Congressional Budget Office, ten years after the Ryan plan was enacted, seniors would pay $6,400 per year more for the same health care. One out of every four dollars spent on transportation—which is already underfunded—would be cut. Veterans' benefits would be cut 13 per cent. Young men Paul Ryan voted to send into combat would suffer once more on the home front. Education would be cut, food safety, air traffic control, environmental protection—almost everything that makes us safer, smarter or stronger—would get hammered.How can a budget so brutal not make a dent in the debt? If you have to ask you have not been paying attention. What is the holy grail for princelings like Mitt Romney and Paul Ryan? Of course: tax cuts for the rich. The Tax Policy Center crunched the numbers and found that under Romney's proposal, 95 percent of Americans would see their taxes go up by an average of $500, but millionaires would receive an extra $87,000 tax cut. The net result: an $86 billion annual shift in the tax burden away from those making over $200,000 a year and onto those making less.